The website offers a world-class collection of printed, electronic and other media. WASHINGTON, DC.- The Smithsonians National Postal Museum announces the launch of the Global Philatelic Library website, a centralized information gateway to the worlds greatest philatelic research. Founding partners include the National Postal Museum and Smithsonian Libraries in Washington, D.C., the Royal Philatelic Society London and the American Philatelic Research Library in Bellefonte, Pa. I consider the project as utterly impossible of any practical execution... One hundred and twenty-four years later the project has become a reality. This ambitious project has become a present-day reality thanks to the inspiration and dedication of the founding partners. 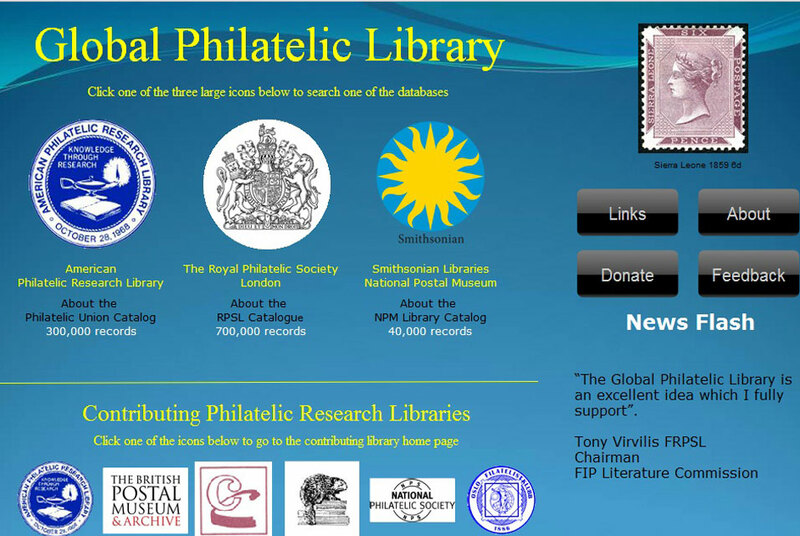 The website establishes a single destinationa responsive centralized gatewayby which philatelists around the world can search, locate and access philatelic research from partner libraries in real time, from any computer. Searchable listings of books and publications, as well as resource locations and access, are now just a click away, providing invaluable resources to those doing philatelic research. Other contributing philatelic research libraries include The Collectors Club Library in New York, Greene Foundation (Canada), Oslo Filatelistklubb Bibliotek (Norway), Philatelistische Bibliothek Hamburg (Germany), Postal History Foundation in Tucson, Ariz., Rocky Mountain Philatelic Library in Denver, National Philatelic Society (United Kingdom) and Western Philatelic Library in Sunnyvale, Calif.